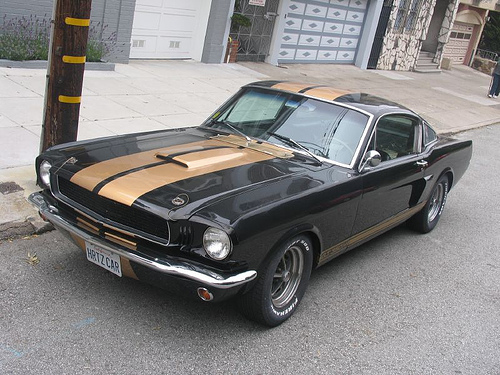 In 1966 the Hertz rent a car company agreed to purchase 1000 Shelby GT 350 for their rental fleet. It ended up that 996 cars were finally deliver to Hertz with Three being wrecked in transit and one being returned before it arrived for an unknown mechanical defect. Most of the Hertz’s car were made in Black with a gold and most had an automatic transmission. The exceptions to that was the first 100 cars sold to Hertz were 4 speeds. It quickly became apparent to them that the 4 speed cars may have not been a good idea. The performance of the car combined with the driving habits of the rental customer added up to many clutch replacements. Some other colors also showed up in the mix, white, blue and red. All the cars had the gold stripe on the side and most had the racing stripes over the top. It is interesting to note that the 66 Shelby GT 350H also had Magnum 500 wheels. The Magnum 500 wheels didn’t make there appearance on the factory Ford cars until 1969. At the time the cars quickly became known as rent a racers. It was not uncommon to have people rent that cars for the week and take them to the local track for some fun. In fact many cars came back from weekend rentals with holes drilled in the floor boards where the roll bars had been installed and then removed. Once Hertz completed the rental terms on the cars most were sold to Ford dealers across the country to be re-sold. Surprising to us now the dealers had a hard time selling the cars because of their rental history. At the time they sold on dealers lots for around $2,500.00. I’d love to buy a few for $2500.00 today. This entry was posted on February 27, 2011, 2:15 am and is filed under Ford. You can follow any responses to this entry through RSS 2.0. You can leave a response, or trackback from your own site.